This is my first time in Club Little House, am so excited about it. She loves her cottage and set about decorating it. Wall papering the walls was a big job for her. But, it came out perfect. Now for making Vintage Clara some new clothes. I love it! She looks right at home. Can't wait for her to get all the goodies from CLH. Clara is adorable! I love it that she's crafty, too, and put up wallpaper in her sweet new cottage. What fun it will be to arrange the furniture and the new treasures soon to come. What a little cutie! And industrious too. 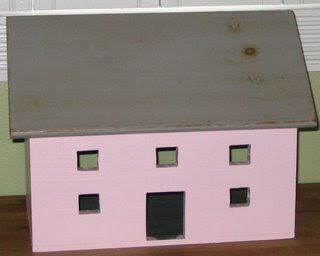 Any girl willing to work to make her house shine deserves a darling doll house! Tee hee!